One would be hard-pressed to find an area of the country where a Walmart retailer does not exist in some form. As the leading retail entity in the country, Walmart has grown to find representation in nearly every major in the country as well as throughout every state. Walmart serves the needs of people and businesses in nearly every conceivable part of the United States, and therefore relies on its transportation team to fulfill the needs of its sizeable customer base. Walmart is recognized as having one of the most impressive and well-known trucking fleets created from a company that is also a retailer. Drivers with Walmart are known throughout the industry for earning some of the best wages in the country in return for their hard work in serving the countless individuals that rely on the stocked shelves of Walmart every day. With research taken from Walmart truck driver salary data across the country, many employees happily report some astounding numbers. On average, Walmart truckers see close to $75,984 per year. This reported pay scale is known throughout the world of driving as one of the most generous income opportunities available to a worker behind the wheel. Because of this, the field for employment can become incredibly competitive and find that only the most qualified truckers represent the blue and yellow vehicles. While the salary offered to drivers is certainly advantageous on its own, the money for drivers does not stop there. Other pay associated with drives for the company exists as well. Compensation For Extra Work: Drivers for Walmart are ensured that they will see pay for any situation, especially when a driver must go the extra mile or pull a slightly longer shift than anticipated. Frequent Bonuses: Safe driving goes a long way at Walmart. For a driver's proven and consistent efforts to promote safety on the road, Walmart will award them with bonuses that reflect the company's commitment to security in driving skills. Pay For Both Hands on The Wheel: Drivers with Walmart find that they will not be asked to perform any duties other than driving. Without the responsibility of unloading and loading freight, drivers can concentrate on the task at hand and truly see pay for what their job title entails. Many see the primary benefit of driving jobs as the ability to work within a large and established company that promotes stability. Retirement Options: Drivers can expect to be taken care of after they hang up their hat (so to speak) with Walmart's retirement program. Making contributions while behind the wheel will see Walmart match this money and provide some financial longevity. Paid Time Off For Several Occasions: The company has a driver's personal life and family in mind, ensuring that paid time off is truly beneficial to those on the road. There is a wide variety of life events in which Walmart will ensure support and pay, ensuring that work never gets in the way of a driver's important personal decisions. Discounts For Associates: Because Walmart maintains such a large retail presence in the country, it's no surprise that drivers find themselves shopping at the company's stores themselves. Those who work at Walmart will receive an ample discount on items sold in the store. Through this, the company makes sure that drivers do not have to expend their paycheck in order to provide for basic essentials. Profit Sharing: As simple as it sounds, the success of Walmart is not only reflected by its employees but is extended unto its workers when the company sees success. With a driving team picked for success, the fleet hitting the long white line is generally one of the most prosperous divisions. How Does Walmart Company Culture Influence A Driver's Salary? While the company is notable for its excellent annual salaries and the benefits that a Walmart Truck Driver may receive, it is also known for its overall identity and the corresponding contributions that this identity may add to a driver's monetary livelihood. Aside from the numerous outlets that exist, Walmart is known to be a provider for many homes and families across the nation. Drivers are the workers that help carry out this mission of providing to those who need their goods and who afford customers the opportunity to never find empty shelves. Through this, Walmart drivers have become the agents of provision in the country. Walmart relies heavily on truckers to keep business going, which is likely the reason as to why their pay is so great. While importance placed on drivers is great and should be noted for its significance in Walmart's trucking fleet, the corporate environment at the company helps drivers strive to perform well, which in turn helps the trucking fleets become recognized as a vital component of the logistics chain. Simply put, when drivers perform well within the structure of Walmart, the atmosphere becomes somewhat reactive to this success, often working in favor of the drivers. Though it is not impossible to gain a driving position at Walmart, there are nonetheless somewhat strict hiring requirements for those who get behind the wheel. Walmart drivers with clean driving records and demonstrated experience are those who greatly succeed at the company, earning the most pay and seeing bonuses related to their driving skills. - A clean driving record: When it is apparent that your driving skills are top-notch and that you will not cost the company money with potential accidents and pitfalls on the road, Walmart sees you as a valuable resource. Enter the fleet with a clean background and you are likely to see a solid financial backing. - Class A License + Endorsements: Every driving position at Walmart will require a Class A license, but not every driver will need an endorsement such as Hazmat in order to attain a job. With that in mind, those who do enter the applicant pool with endorsements may lead the pack and may be considered for specialized opportunities with specialized pay. - Located In Hiring Radius: Walmart generally only looks at applicants who are located relatively close to their trucking hubs. This makes sense, however – they want to hire individuals who are unlikely to waste personal resources coming to work and who will not be financially or personally burdened by their trek to work. Does Walmart Pay Their Drivers Well? Simply put, Walmart is seen as somewhat of the golden goose of trucking for many drivers looking for work. With an excellent yearly pay, bonuses for drivers who are on top of their skills, and an infrastructure that leads to success, its no wonder that Walmart excels within the trucking community. 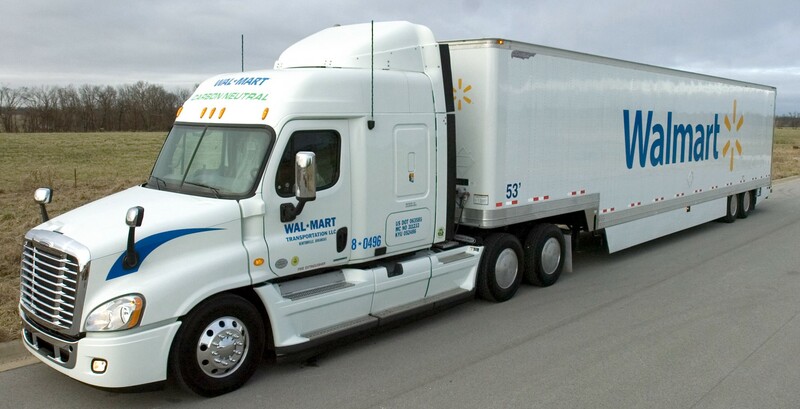 Just as Walmart has become a staple for consumers, the trucking fleet at the company has become a continued source of profitability for those who work in the cab. As it becomes perhaps the premiere dominate force on the road, many find that Walmart is unparalleled in its dedication to giving drivers they money they need.